Detroit is a city of rich contrasts offering a vast array of historical, cultural, and literary platforms for artistic exploration. Since 2008, Canadian visual artist Monika Berenyi has focused her creative interests on developing alternative mechanisms to address and document an extraordinary period in Detroit’s literary history: the poetry and independent print culture that flourished during the 1960s and 1970s. Through research and community engagement, she has shaped these important materials into an interactive oral history project composed of digital-video interviews, text-based archival files, transcriptions, photographs, and ephemera. In 2010, the materials were donated to Wayne State University’s permanent Cass Corridor Archival Collection. The Collection is comprised of materials which illustrate the Cass Corridor’s vibrant history of creative productivity in the areas of literature, art, and music. The Detroit City Poets Oral History Project materials now form a sizable component of the Literary section, and Monika will continue to work in collaboration with Fine and Performing Arts/Media Librarian Diane Sybeldon on the expansion of the collection. Diane serves as the director of the Literary section and has been an instrumental force in stabilizing the greater Cass Corridor Archival Collection. Throughout the twentieth century, Detroit’s history was considerably influenced by a burgeoning auto industry and the great migrations (South to North). The impact of the Great Depression , WWII heavy industrialization, and lingering socialist ethos of the Roosevelt administration further defined the spatial environment in which the poets of the 1960s and 1970s evolved. It was during the civil rights era, a time of great social turbulence and change, that the poets emerged with their own form of distinct Detroit expression. The systematic nature of Detroit’s once highly mechanized economic structure is a leitmotif to the Detroit’s literary arts community. In the urban neighborhoods of Detroit, a vibrant and resilient community flourished, emphasizing a self-engineered, work- based creative aesthetic . During the 1960s and 1970s, the process of producing and disseminating independently pressed poetry reached a zenith. The literary and artistic value of the productions are worthy of independent discussion. Themes concurrent with the times of the day were explored within the context of a greater Detroit, and the most notable printed form used for dissemination was the broadside. In the context of American literary history, the creation and dissemination of poetry within an independent press culture has been widely recognized and documented in epicenters such as New York, San Francisco, and Chicago. 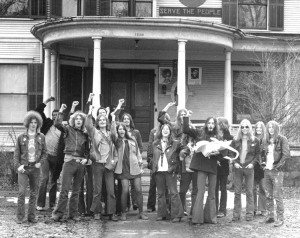 The Detroit City Poets Oral History Project was established as a platform for exploring the wealth of Detroit’s literary history and print culture of the 1960s and 1970s. Social interaction within Detroit’s literary community and acquisition of primary source materials form the base of Monika’s archival process. The four printing presses in question are: Broadside Press, Lotus Press, Alternative Press, and Artists Workshop. Study of both the period and aforementioned presses is of importance for several reasons: an organic collaboration and integration period between white and Afro-American writers was fostered; one of the largest epicenters for the dissemination and publication of Afro-American literature in the United States was established; a distinct independently operated creative print culture flourished; and a valuable literary heritage took form, one that has thus far received marginal coverage in the field of American literary history. The Detroit City Poets Oral History Project continues to this day, through the active collection of primary resource materials, deposited at Wayne State University’s Cass Corridor Archival Collection- Literary section. The intent of the project is to foster community involvement in the preservation of memories and archival materials, and to provide the public and scholars with educational resources that encourage awareness of Detroit’s rich literary history. In 2009, a round of oral history interviews was successfully conducted in Detroit, and in honor and celebration of the project, a poetry reading was held at the Detroit Museum of Contemporary Art [MOCAD], on April 16th, 2009. In the spirit of the cultural tradition of gathering and sharing poetry in free public forums, the event drew an amorous crowd. Among the readers were poets from the legendary Artists Workshop, Alternative Press, Broadside Press, and Lotus Press, including Detroit poet laureate Naomi Long Madgett, John Sinclair, Melba Joyce Boyd, Bill Harris, James Semark, George and Chris Tysh, James Semark and others. During the month of April, 2010, a round of oral history interviews was completed at Wayne State University, and projections for the digitization of the project within both a physical and web-based platform planned. On December 4, 2010, a permanent exhibition of the Cass Corridor’s Archival Collection opened at Wayne State University’s Undergraduate Library, featuring a range of materials from Detroit’s poets, artists, and musicians. During the spring of 2011, a round of oral history interviews were conducted, and during the 2011-2012 academic year, courses taught in the English departments at both Wayne State University and Eastern Michigan University engaged materials from the Literary section of the Cass Corridor Archive. In the autumn of 2012, an oral presentation, detail research findings and project content was delivered by Monika Berenyi at the Mid-America College Art Association Bi-Annual Conference. Plans for an exhibition exploring text-based archival materials and documentation processes within a 3-dimensional gallery space are in the works. The goal of the envisioned exhibition is to present the visual and literary value of the archival materials and to stimulate cross-disciplinary dialogue on the process of collection-creation, implementation of useful innovations (digital applications), and utility of these materials within the arts and humanities The translation of Detroit’s print culture within a gallery space will also raises historical questions regarding the processes of how visual culture is produced at historically specific moments, and how this material may be presented in the post-modern era. The curatorial concept would be of particular interest to any custodian of print culture in library collections, as the elasticity of the gallery space offers an opportunity to open what is usually perceived to be held behind closed doors and within closed files. This entry was posted in The Detroit City Poets Oral History Project on September 14, 2013 by mberenyi.